Soybeans: U.S. Producing More but Enjoying it Less? The major source of price and income problems for soybeans is different from grains when compared to what was expected at the time the new farm bill was passed. The problem source is not unrealistic export projections and above average yields as is the case for corn. Rather, the major cause of price and income problems in soybeans is the mammoth increase in planted acreage—acreage increases that could not have occurred without the planting flexibility provision of the 1996 Farm Bill. Under previous legislation, producers had to plant program crops to receive deficiency payments and other benefits. For example, cotton producers with an established cotton acreage base had to plant cotton to receive cotton program benefits. The same rules applied for corn, wheat and a few other crops. Soybeans, on the other hand, were not part of the target-price, deficiency-payment, acreage-reduction structure of previous farm programs. So, under the previous farm program, acreage that might have otherwise been planted to soybeans was planted to grains and cotton so producers could retain their eligibility for deficiency payments and preserve their acreage base for the future. When farmers became free to allocate acreages as they pleased, soybean acreage shot upward (figure1). Figure 1. 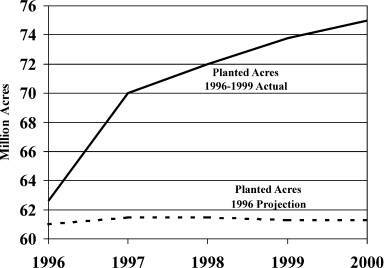 Comparison of actual soybean planted acres for 1996-2000 and USDA World Agricultural Outlook Board February 1996 projections for the same years, assuming the continuation of the 1990 Farm Bill. Why were farmers so poised to increase soybean acreage? Was it because the soybean loan rate was/is relatively higher than for other crops? No doubt that had an effect. But it is important to note that over two thirds of the increase in plantings (10 million acres worth) occurred before crop prices fell below their loan rates. Prices began their fall in mid-summer of 1998, well after planting time for the 1998 crop. The lion’s share of the increase in soybean acreage occurred for agronomic and production reasons. Without acreage controls on other crops, soybeans can become a bigger factor in producers’ crop rotation decisions. In the midwest, for example, farmers can choose rotations such as half soybeans and half corn. Likewise, for land that is at some distance from their base operation, farmers can minimize equipment movement by planting whole farms to soybeans one year and corn the next. For these reasons and others, it is clear to me that even if the loan rates are realigned, we should not expect soybean planted acreage to drop below the 1998 level of 72 million acres. It will make no difference whether loan rates are adjusted upward for grains to be in line with soybeans or downward for soybeans to make the soybean loan rate more comparable to the loan rates for grains. The rotation effect is too dominant. It should be obvious by now that changing loan rates would only affect the mix of crops by shifting a few million acres from one crop to another. Loan-rate realignments would have virtually no effect on the total acreage of all crops. The blanket of low prices would remain over all crops. Before the current bill was passed, some folks said that the U.S. did not produce sufficient soybeans to take full advantage of the export market. Higher acreage and lower prices, it was said, would ensure that the U.S. would not forfeit soybean exports to Brazil or other competitors. So what has the increase in soybean production meant for exports? Well, compared to the relatively high soybean exports during two crop years prior to the new legislation, exports continued at about the same level. But compared to the early 1990s or the projections for the period 1996 to 2000 published in February 1996 by USDA’s World Agricultural Outlook Board, soybean exports have been up considerably the last four years. In 1999, for example, exports were 25 percent greater than the projections by WAOB. Figure 2. Soybean Price 1996-2000, actual and WAOB February 1996 and February 2000 projections. 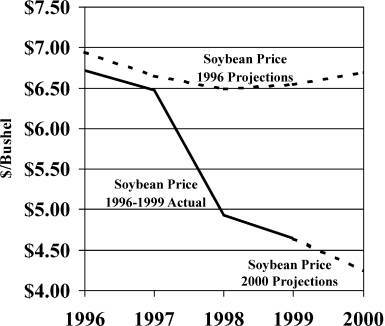 Even though actual exports for the 1999 crop year were nearly 200 million bushels above the February 1996 export projection for the 1999 crop, soybean’s sharp price decline (figure 2) meant soybean’s export value was down nearly $600 million dollars from the projections (figure 3). Reduction in value of over $1 billion dollars occurred in 1998 ($4 billion actual versus a projection of $5 billion) and is expected to occur in the 2000 crop year ($4.3 expected now versus $5.3 projected in 1996). Export values were at relatively high levels in 1996 and 1997 reflecting both good export levels and prices. The 5 year cumulative loss in export value, when compared to the 1996 projections, could exceed $1.6 billion by the end of the 2000 marketing year. Figure 3. Value of Soybean Exports 1996-2000, actual and WAOB February 1996 and February 2000 projections. So, if one is willing to attribute all the increased soybean exports beginning in crop year 1998 and continuing through crop year 2000 (compared to export levels that had been projected for those years in 1996) to larger soybean acreages and lower prices, should exporting more be judged a success even if the total value of exports drops? In the current environment, farmers are producing more and receiving less. The large acreage and production increases have generated reduced market receipts since 1998 due to sharply lower prices. Large loan deficiency payments have filled much of the revenue gap. But, since production costs must now be paid on 72 million acres, not 62 million acres, net returns to the soybean sector are generally lower. I firmly believe that Brazil will continue its soybean production expansion plans whether the price of soybeans is $6.75 per bushel or $4.25 per bushel. An extraordinarily higher price would make a difference and an extraordinarily low price, well below $4.25 per bushel, may get them to react, but as long as prices are within a fairly wide band, it makes little difference in Brazil’s soybean production whether prices are near the upper or lower portions of a price band. So from the U.S. perspective, are we producing more but receiving less return so as to export more but receive less in export revenue? Maybe the days of reduced soybean acreage and higher prices—indirectly fostered by farm programs for other crops—weren’t that bad after all.